One partially goes to routine appointments to find out if one actually has needs above and beyond the routine. And so it was for Abigail. We took her to the dentist a couple weeks ago, expecting a quick cleaning and flouriding and then we’d be on our merry way. The dentist noticed a problem in one of her front teeth. The problem was that it was no longer alive and kicking, probably as a result of a fall, a bump or another sort of tooth bashing encounter. It had developed an abscess. Eager to overcome this difficulty, we asked what we could do to alleviate the infection. So as not to alarm the three year old in the chair, the dentist mimed putting her hand over her own incisor and yanking down, making a click noise as she did so. The tooth had to come out. This course of action had no occurred to me at the time. It took me the next week, when we were giving her antibiotics to minimize the infection before the procedure, to come to terms with this. I looked for ways out of the procedure, alternatives. But there weren’t any. We didn’t want the infection to spread. The tooth had to go. And so it did. I give you the new, the improved, the less infected, Abigail Gorman. Now with 5% more gaps! She handled the procedure as a model patient and within a few hours she was her own self, very pleased with the new space in her mouth. She got to show it off as school and, being such an enthusiastic smiler, any she displays it every time we take a picture. All in all, she came through it better than I did. 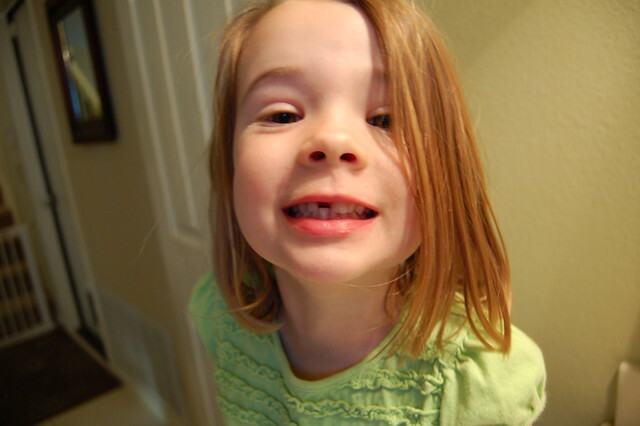 It helped that the tooth fairy was extremely generous. This entry was posted in Abigailia and tagged Dentist, Incisor. Bookmark the permalink. Poor Abigailia! She looks adorable as always. I am glad she did so well.